Hong Kong Hiking: not three words you’d expect to find in the same sentence. Unsurprisingly - given its urban reputation – few people know that the majority of Hong Kong is wilderness. The New Territories and Outlying Islands, like Lamma, offer swathes of dense, jungle-like greenery, gleaming gold beaches, and some fantastic hikes. There are Hong Kong hikes for all levels of ambition and physical fitness, from those who want to go Bear Grylls and spend a day battling caverns, mountains, and evil looking caterpillars, to short sharp hikes that end with a sun lounger and a cocktail. Here are the top five places to go hiking in Hong Kong. Winner of Time magazine’s best urban hike in Asia. It's a title which is potentially misleading – as there is nothing urban about the Dragon’s Back – this is one of the most popular Hong Kong hikes. The urban hike moniker is thanks to the Dragon’s Back being within breathing distance of Hong Kong’s skyscrapers, yet set amidst complete, unspoilt beauty. Found on Hong Kong Island’s wild south side, the Dragon’s Back winds across the ridges of Shek O Country Park affording superb views over Clearwater Bay and several uninhabited islands stranded out in the South China Sea. At the end of the trail is Shek O – an attractively ramshackle seaside village with a handful of bars and restaurants and a couple of excellent beaches. This is also the only place in Hong Kong where you can try your hand at surfing. Difficulty: 3/5. The Dragon’s Back is sometimes characterised as one of the easier Hong Kong hikes. It is, but it’s no stroll along the promenade either. It does require a decent level of physical effort and boots. That said, it is certainly accessible to the non-hiker, nor does it require special equipment. Where: This is the difficult part. The Dragon’s Back is not easy to reach and not really its own hike (it's actually part of the Hong Kong Trail part 8). To reach the Dragon’s Back take the number 9 minibus from Shau Kei Wan MTR. Get off at To Tei Wan – you may need to ask a passenger - and the hike is about 1km uphill from the road. There are then signposts for the trail. Ok, so regular Hong Kong hikers are going to complain that the Peak isn’t a great hike. They’re right. If it’s a real hike with challenging paths and machete hacking greenery to swipe through you’re looking for, head for our New Territories and Outlying Island hikes. The Peak is essentially one long uphill struggle…on tarmac. So what’s the attraction? Simply put, the view. The Peak is Hong Kong’s most famous attractions but most people only see the view from the top after being delivered there by the Hong Kong tram. Instead, you can watch the views unfold before you as you climb the side of the Peak. It’s far more impressive. Difficulty: 1/5. As a hike it’s simple. The whole walk is on tarmac. The whole walk is also uphill and parts are steep. You can take regular breaks along the way and return to the city via the Peak Tram. Where: There are a number of ways to hike up Victoria Peak. Arguably the most peaceful is from within the grounds of the University of Hong Kong, which will then lead you on to a dedicated trail up the peak. 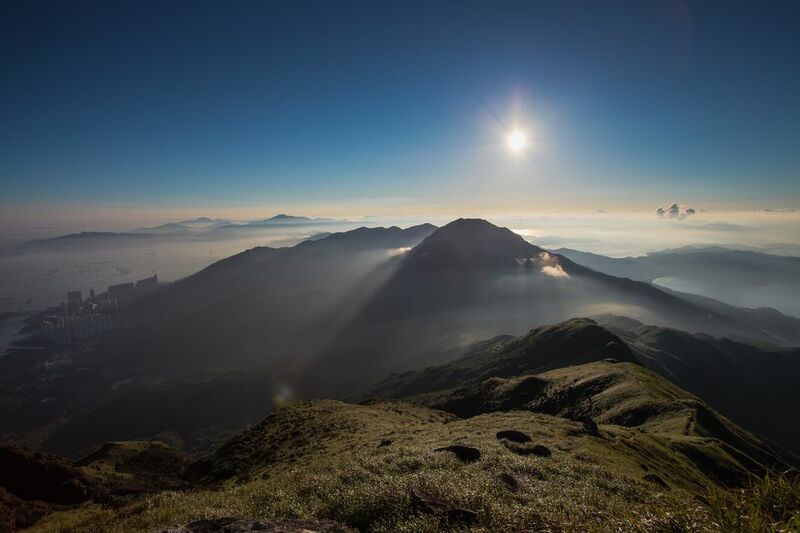 The blockbuster hike; at 934 metres, Lantau Peak is Hong Kong’s second tallest mountain – Ma On Shan is the tallest but only has a service road and no dedicated hiking trails. 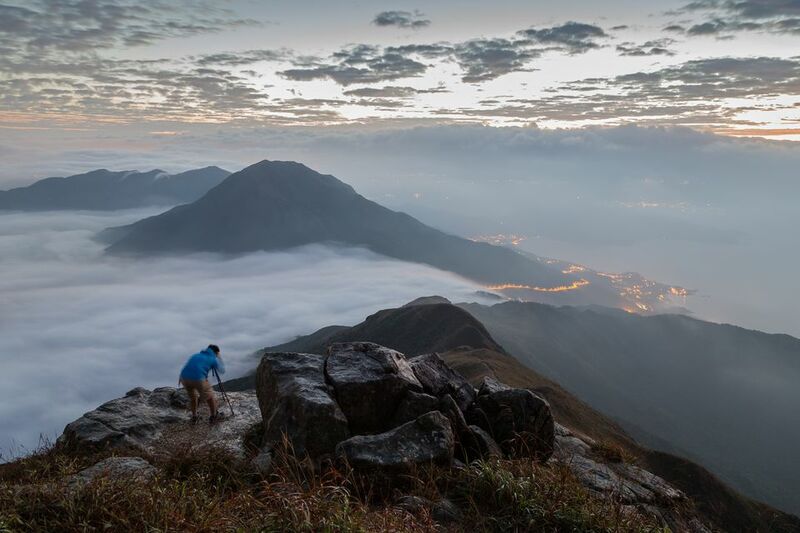 There are several hiking trails crossing Lantau Peak, although one of the most popular and possibly the most difficult is a very early morning ascent from foot to peak to make it for the sunrise. The wisdom of climbing a very steep and potentially dangerous mountain in the dark we’ll leave to you and your insurance company. Most of the trail is paved, although the stone steps can be difficult and the general incline is steep. It’s also worth mentioning that the trails in this area are some of the most popular hikes in Hong Kong. The route can be packed at weekends and on public holidays. On Sundays you’d swear the peak was busier than Causeway Bay. At the top of Lantau Peak you’ll find the grand Big Buddha statue and monastery, which is a good place to grab a few snaps and refill on food. The hike itself affords excellent vistas over the thick greenery that carpets Lantau and onto the South China Sea. Take the Ngong Ping cable car back down the mountainside for more amazing views. Difficulty: 3/5. The sheer incline makes this a difficult climb. Some of the paths are narrow and the steps crumbling. It's a hike that requires physical fitness. Where: The trail starts between Mui Wo and Tung Chung. The easiest way to reach it is to take the MTR to Tung Chung and then a bus towards Mui Wo. Ask the driver – probably with the help of passengers – to drop you at the start of the Lantau T​rail. There is a signpost. This is arguably the most ambitious of the Hong Kong hikes we list. If you’re looking to get dirt under your fingernails and grass in your underpants, this is the hike for you. Set in the great green outdoors of Hong Kong’s New Territories, Lion Rock Country Park is one of the original Hong Kong parks. It forms part of the MacLehose Trail, a hiking path that crosses the New Territories from east to west. This hike, up to Lion Rock, is actually part 5 of the MacLehose Trail and as such well signposted. The hiking is tough going; dipping between several sweat-breaking peak climbs on stone tracks or off-road. The reward is spectacular views over the New Territories and having Kowloon and Hong Kong Island laid out at your feet. You can see the whole city and this is a hike really made for one of Hong Kong’s rare clear days. Difficulty: 4/5. Parts of the Lion Rock climb require all fours scrambling. You’ll need to be fit to reach the summit, walk the path and descend back down. It’s a hike you’ll certainly feel the next morning. Where: There is a number of jumping on points. For the start of the trail head for the Gilwell campsite –you’ll need a taxi - that runs across Beacon Hill and ends at Tai Po Road. Hong Kong’s great green getaway; Lantau is a fantastic location for a breath of fresh air and break from the constant hustle that is Hong Kong Island. Just a short ferry ride from Hong Kong Island, Lantau is famed for its more laidback, long hair, hippy appeal. Much of the attraction lies in the fact that Lantau allows no cars; transport is by two wheels or two legs only. The best way to see the island is via the Family Trail hike, which meanders through the island’s green interior between the two main villages of Yung Shu Wan and Sok Kwu Wan. As the island’s capital, Yung Shue Wan has a handful of excellent al fresco bars where you can while away a few hours or head to Sok Kwu Wan to try its famed seafood restaurants. Along the hike, you’ll also find a couple of golden beaches that will usually be deserted during weekdays. Difficulty: 1/5. This is a wholly paved route between the two villages with only a handful of moderate inclines. Where: Take a ferry from central ferry piers to Yung Shu Wan and find the trail at the end of the single main street. Once you reach Sok Kwu Wan you can take a ferry back the other way. Do check ferry times in advance as they can be infrequent to Sok Kwu Wan.